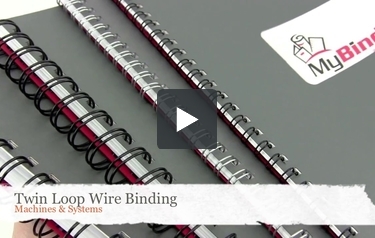 MyBinding.com carries a huge selection of twin loop and wire-o binding machines. Choose from systems manufactured by Akiles, GBC, Renz, Tamerica, DFG and Rhin-O-Tuff. Whether you need a machine that does 3:1 pitch for smaller books, 2:1 pitch larger books, or a combination system such as the Akiles Duo Combo, we have what you need. For smaller volumes check out options with a manual punch or if you do a lot of binding you might want to consider an electric system. We even have options for print shops and binderies as well as stand-alone wire closers and closing devices. Also, be sure to check out our huge selection of supplies and covers to go with your system. Browse the options below and don't hesitate to call us or email us if you have questions.